Bad bad bad bad bad Day. Can’t get out of my way. Can’t say the right thing. Can’t do the right thing. I might just throw rotten eggs at the mirror. Written out in capital letters all over your forehead? I guess. Through gritted teeth. And he hugs me and tells me that I don’t have to save the world after all. and he eats the chocolate chunks out of my ice cream. and suddenly, I feel as though it’s been sort of a good day all the same. Because Washboard Storms is so Random. No one can remember the name. But anyway, that’s why the name is different – what do you think? But I will have you know – who ever you are – that I have gotten some of the best food ideas I have ever SEEN on Pinterest. I mean, really – who ever truly knows what to do with a cauliflower. You buy them on sale, they sit in your crisper looking a white, frozen brain – it’s creepy. The only decent way to end the thing is by boiling it to death in salty water, cutting it into little pieces and dipping it in ranch dressing at parties or- if thee be ambitious – baking it in a cheesy casserole. Cheesy Brain Casserole. I’m lovin’ it! Just like that -like some Good Kitchen Fairy suddenly appeared and smacked me with the computer mouse. Search for cauliflower ideas on Pinterest. So I did. And I made baked cauliflower with herb seasoning and pine nuts. Sounds infinitely more interesting than cheesy brains. enough olive oil to toss the cauliflower in – I probably used 4 or 5 good Tablespoons. Not only did I use my addiction to Pinterest to find the inspiration for this meal, but I cheated and used an all natural spice packet that came in a box of couscous mix that we ate the couscous from – *without* the mix at a previous meal. But you don’t have to depend on your mental weaknesses, you can spice up your cauliflower with curry powder and turmeric or basil and garlic or ginger and sesame seeds. The sky’s the limit people… the sky is the limit. 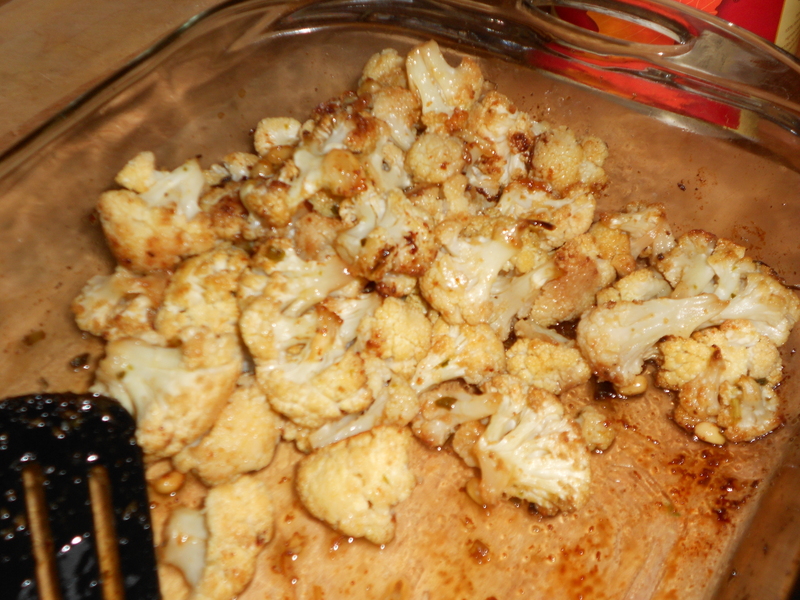 Toss the cauliflower with the oil and then the seasonings, making sure they’re all covered pretty well. Toss onto a baking sheet – or if your baking sheet is irreparably damaged by past abuse (as is mine), feel free to use a glass casserole dish. Be my guest. Now, it goes into the oven at about 350 degrees, until the cauliflower is well browned. Mine was cooking for about 30 minutes until I panicked and remembered that it was baking. Turns out that was the perfect amount of time. This is going to be one of those awful posts in which I ramble on and on about my random life and don’t really say anything helpful or clever or tasty at all. Almost a week ago I had my four wisdom teeth *extracted* – my mouth feels strangely dumb and empty without them, but all the same – they are gone. I have spent the past many days in a semi-delirium of pain and pain medications as one of the sockets slowly dried out instead of healing. I am feeling much better now, thank you, and have begun weaning myself off the narcotics so that I may do useful things like think and work and cook dinner. All I remember from the last week has blended together in my mind like one big smoothy of ice cream, salt water, antibiotics, and this strange image of Julia Child, standing over a stick of cold butter, waving a gigantic wooden rolling pin around in the air while saying, “And so we must beat the butter…” in her cheerful, breathless way.